Situated in an exceptional rural position with spectacular panoramic views to all elevations. This detached traditional farmhouse has been significantly improved and extended to create a wonderful family house of great character and modern facilities, along with gardens, patios, orchard and vegetable garden. An ideal property for equestrian use with stable block and acreage. The property is being offered with a curtilage of 9.958 acres at £1,285,000. 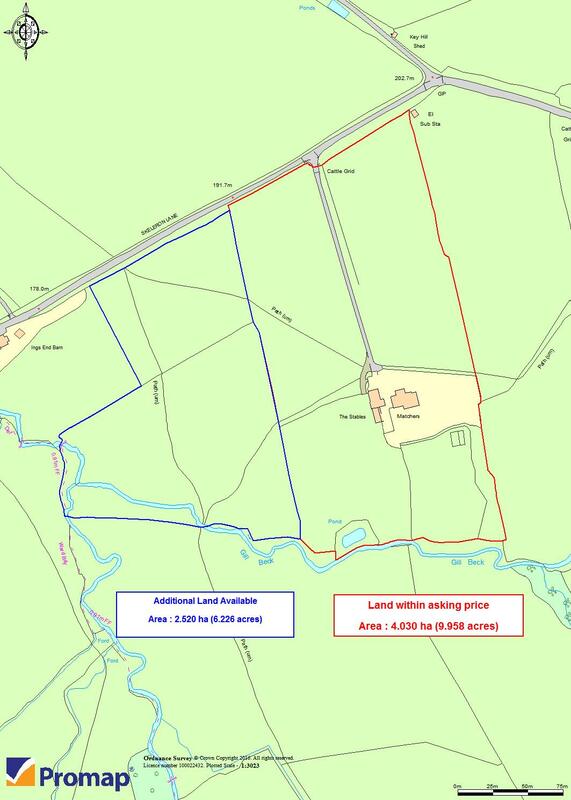 Additional land of 6.226 acres is available, totalling 16.184 acres at £1,350,000. A separate detached building has been constructed to the highest of standards to provide garaging, office accommodation and stabling. The property is set in just over two acres of meadow land with mature lawn gardens and stone patios to the south elevation. Sturdy oak panel entrance door with double-glazed side windows. Stone flag floor, double radiator, double-glazed side window and low-voltage spotlighting. Accessed off entrance hallway with external oak panel personnel door, stone flag floor, double radiator, sealed unit double-glazed timber window to front elevation and low-voltage spotlighting. Stone flag floor, double radiator and timber beamed ceiling. Range of high-quality fitted light oak kitchen furniture with free-standing hand-painted island bar, black granite work surfaces, oil-fired four oven Aga in green with complementary back tiling and stone mantel. ‘Siemens’ ceramic hob, ‘Siemens’ built-in electric grill, built-in wine fridge and built-in ‘Siemens’ dishwasher. Stone flag floor, timber ceiling, low-voltage spotlighting, double radiator, pitch pine double-glazed windows to gable and rear elevations. Stone dressed fireplace with multi-fuel cast-iron stove. Stone flag floor, low-voltage spotlighting and double radiator. With adjacent garden conservatory room open to dining area and kitchen area. Stone fireplace with flue, timbered shelf alcove and cupboards to either side of chimney breast, two double radiators and stone flag floor. Leading to garden conservatory area with pitch pine double-glazed windows and French doors. Split-level lounge with dressed stone fireplace with multi-fuel stove, double-glazed windows to front, gable and rear elevations, two double radiators, feature timber ceiling and stanchions. Wash hand basin in marble vanity with timber cupboards beneath, low-level WC, fitted cupboards, Understairs storage, radiator and sealed unit double-glazed timber window. Solid oak traditional staircase with turned spindles, newel posts and handrail. Open landing area with matching balustrade, single and double radiators. Oak panel floor, fitted wardrobes, double-glazed timber windows, two double radiators, ceiling speakers and low-voltage spotlighting. With walk-in tiled shower, ‘Villeroy and Boch’ wash hand basin with fitted mirrored cabinet, ceramic tiled floors, low-level WC, single radiator, chrome radiator towel rail and low-voltage spotlighting. Double radiator, two double-glazed windows, beamed ceiling and oak panel floor. Double-glazed timber window, double radiator, fitted desk and wardrobes. Oak panel floor. Containing three-piece suite comprising spa bath with shower fitment over, low-level WC, pedestal wash hand basin, oak panel floor, half ceramic walls and beamed ceiling. Oak laminate floor, double-glazed window and double radiator. With fitted shelving and hanging. Timber floor, fitted cupboards, double-glazed timber window and double radiator. Containing three-piece suite, double radiator and double-glazed window. Fitted cupboards and drawers, double radiator and double-glazed timber windows to front and gable elevations. A recently constructed superb garage and office block with stabling constructed to a very high standard and matching the principal house. Double oak double-glazed garage doors, timber double-glazed windows and two double radiators. Adjacent workshop with oil-fired ‘Worcester’ boiler supplying central heating and domestic hot water, light and power installed. Sealed unit double-glazed timber window to rear elevation. Stainless steel sink with base units. Single radiator, separate WC and access to first floor office accommodation. First floor office accommodation which can be accessed independently from the garaging and could easily form an apartment for dependant relative or staff. Travertine tiled floor and double radiator. Return oak staircase with chrome handrail and courtesy lighting. 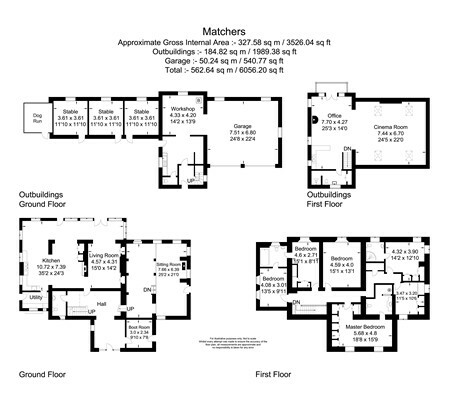 The first floor accommodation is open plan with office, kitchen area and leisure suite but could easily be converted to an apartment for dependant relative or staff quarters. Open plan leisure area with engineered oak flooring, four timber electric Velux skylights, built-in AV sound and vision system with “sonos”. Double radiator. Engineered oak flooring, wall-mounted log-burning stove, timber double-glazed French doors leading to stone balcony, built-in kitchen fitments with double bowl sink, built-in fridge/freezer and wine cooler and double radiator. Fully tiled shower cubicle, wash hand basin and low-level WC. There is a single storey stable block providing three quality stables with light, power and water installed. Large stone and galvanized dog run with concrete base adjacent to the stable block. Dressed stone flag patio area and lawn with surrounding hedges, orchard and vegetable garden behind Beech hedge with timber shed. To the rear north elevation is a large chipping parking area for several vehicles. The property is set in 9.958 acres of land with private tarmacadam driveway leading to Skeleron Lane. There is additional land available of 6.226 acres or thereabouts available at a price of £65,000. Mains electricity, mains water, oil-fired central heating and domestic hot water.